Pacific Gas and Electric Company (PG&E) prepared a Work Plan (the Groundwater Corrective Measures Implementation/Remedial Design [CMI/RD] Work Plan for Solid Waste Management Unit [SWMU] 1/Area of Concern [AOC] 1 and AOC 10) with design schedules to implement the remedy. Based on the format and schedule outlined in the Work Plan, PG&E submitted the Basis of Design/Preliminary (30%) Design on November 18, 2011. On April 5, 2013, PG&E submitted the Basis of Design Report/Intermediate (60%) Design document. On September 8, 2014, PG&E submitted the Basis of Design Report/Pre-Final (90%) Design document. On November 18, 2015, PG&E submitted the Final (100%) Design document for approval. The Final (100%) Design Report included comments received on the 90% and the Supplemental design. DTSC approved the final design after certification of the groundwater remedy Final Subsequent EIR on April 24, 2018. The final remedy will require a supply of freshwater. On January 28, 2013, PG&E submitted an Implementation Plan for Evaluation of Alternative Freshwater Sources in the Topock Remediation Project Area to identify the most appropriate freshwater source. On September 4, 2013, the California Department of Toxic Substances Control (DTSC) and the U.S Department of the Interior (DOI)The United States department charged with conservation and development of natural resources. The U.S. Department of the Interior uses sound science to manage and sustain America’s lands, water, wildlife, and energy resources, honors our nation’s responsibilities to tribal nations, and advocates for America’s island communities. approved the implementation plan, which proposed installation and evaluation of new water supply wells in Arizona. See the figure below for the freshwater source locations. 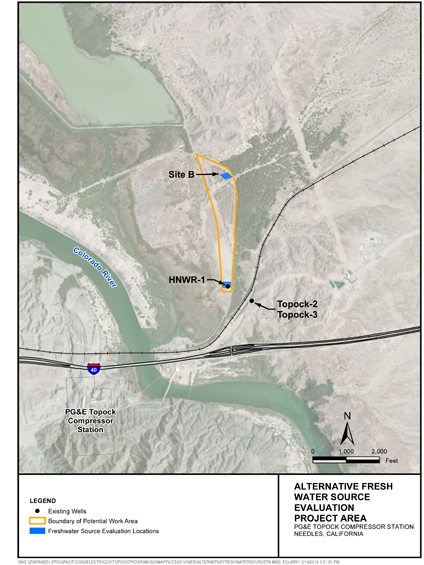 A Summary of Findings Associated with the Evaluation of Alternative Freshwater Sources in the Topock Remediation Project Area, Pacific Gas and Electric Company, Topock Compressor Station, Needles, California was submitted April 2, 2014. Based on these findings, DTSC and DOI directed PG&E to conduct additional field work. The additional field work was completed mid-July 2014. An addendum to the above-mentioned report was included as an appendix in the Pre-Final (90%) Design report and the Final (100%) Design published November 18, 2015, and can be found here. The Topock Project Site (Site) is contained within a larger geographic area that is considered sacred by some Native American Tribal Nations. In the 2011 Final EIR, DTSC concluded that the 779.2‐acre Site “appears to qualify as a historic resource under the California Environmental Quality Act as an area that is significant in the social and cultural annals of California,” and the U.S. Bureau of Land Management (BLM) also has determined that a traditional cultural property or property of traditional religious and cultural significance that is eligible for listing in the National Register of Historic Places exists in the area of the Site, within the current Area of Potential Effect, consisting of 1,600 acres of surface area and a section of the Colorado River. Among the larger and better known cultural resources on the Site is an expansive desert geoglyph or intaglio known as the Topock Maze. For these reasons, all remedial activities at the Topock Compressor Station are planned in such a way as to minimize impact to this area. Impacts to cultural and archaeological/historical resources will be minimized by implementing the mitigation measures required by the Mitigation Monitoring and Reporting Program (MMRP) adopted by DTSC in 2011 as part of the certified EIR, which was amended in the 2018 certified Final Subsequent EIR, as well as measures under the Programmatic Agreement, the Cultural and Historic Properties Management Plan, and in consultation with Tribal Nations throughout the investigative and remedial activities. A large portion of the Site and surrounding area is within the Havasu National Wildlife Refuge. Portions of the Site are also located in a Riparian and Cultural Area of Critical Environmental Concern and the Topock‐Needles Special Cultural Resource Management Area, designated under the BLM Resources Management Plan. Impacts to biological resources will also be minimized by implementing the mitigation measures required by the MMRPs, as well as compliance with Applicable or Relevant and Appropriate Requirements included in the DOI’s Record of Decision. PG&E has also worked closely with biologists to ensure appropriate measures are taken to protect sensitive desert habitat during all aspects of Project implementation. A Programmatic (overarching) Biological Assessment (PBA) was completed in January 2007 to cover remediation and investigation projects at the Site up to the final groundwater remedy. On December 27, 2012, the 2007 PBA was modified and extended for 5 years (until 2017). Authorization for the extension and modification of the 2007 PBA can be found here. A new PBA was submitted on April 28, 2014, and covers activities related to implementation of the groundwater remedy. The 2014 PBA can be found here. Concurrence from DOI for the PBA was received July 7, 2014. For habitat improvement, mesquite trees were planted by PG&E on the Havasu National Wildlife Refuge and a drip irrigation system was installed to ensure their survival. Surveys and monitoring to ensure biological and cultural resource protection will continue to be a priority as investigative and remedial activities progress at the Site. A listing of recent surveys and monitoring activities is provided here.